In a first-of-its-kind panel discussion, international public service media representatives, academics and Generation Z used their collective expertise to try to understand and predict what the future forms of public service news will be. LSBU’s Head of Creative Technologies, Professor Lizzie Jackson, said the discussion focused on how public service media could navigate the challenges of an ever-evolving digital media landscape and continue to service the public in a meaningful way. “Digital media distributed via computer networks offers exciting possibilities for media firms, not least for public service media, however, many public service media – along with other ‘legacy media’ are finding it more problematic to adapt to digital production processes than ‘internet born’ media firms such as Netflix and Amazon Prime,” she said. “Not only this, but young people are accessing and using the media in different way to previous generations. This indicates the adaptation of public service media is urgent. Former head of strategy and transformation for Canada’s CBC News, Andrew Cochran, said he first entered public broadcasting in the 1960s because he felt his generation was being misrepresented, and compared his feelings then to those of Generation Z now. “I don’t think any other broadcaster, apart from the public broadcaster, would have gone to the effort to make sure our voice was heard,” he said. Web scientist and founder of FlyingBinary, Dr Jacqui Taylor, said public broadcasting was already behind in terms of keeping up with changing technology. “Can (public broadcasting) be relevant? Yes. Is it currently relevant? No,” she said. Head of Public Value at Austria’s public broadcaster ORF, Dr Klaus Unterberger, said while there was ongoing disruptive change to the media and its traditional practices, problems were easily addressed by simply asking and listening to what the audience wants. “At ORF, we conducted the Generation What? Project, connecting with one million young people to ask what they want from us, and implemented what we learnt,” he said. The panel was chaired by LSBU’s Dean of Arts and Creative Industries, Professor Janet Jones and also included University of Warsaw public service media academic Dr Michal Glowacki and LSBU 3rd year multimedia journalism student Daniela Cardoso. 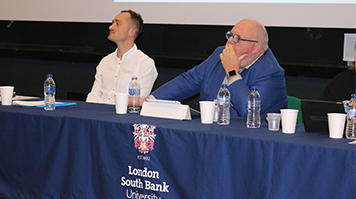 The panel discussion launched LSBU's new Creative and Digital Economy Institute and was part of a wider event series called Think | Make | Show. The Institute aims to develop initiatives in advanced digital practice, products, services and research to encourage partnerships with local and national practitioners and assist the creation of cross-platform ideas with partners in a multi-disciplinary approach.